There is so much disagreement and talk about how we should eat. Especially on terminology. Previously I wrote something about How We Were Designed To Eat. Diversity - Right now most of the things we eat are based around soy, wheat, corn, potatoes, or sugar. This is the opposite of how we should eat. We are used to a diet high in diversity and different species. It was a key to our survival and we cannot synthesize a lot of the nutrients we need to survive and we got them from many sources. Whether its a host of plant life, or if from animal sources, many species as well as bone and organs. Not only that but diversity was also how we limited too much consumption of any one toxin. Just like a diversified portfolio, we need a diversified plate of food. Fresh foods - We are evolved to eat fresh foods. Foods that are ripe and fresh are at their highest nutritional value. Some foods preserve well like nuts, hence why they have always been a part of all diets. But other ways to preserve food from artificial or natural ways all work by inhibiting bacterial growth. Our gastrointestinal system also has bacteria though which helps us digest, regulate immune system, and many other helpful actions. So if we eat a lot of preservatives, how does it affect the good bacteria in our bodies? Whole foods - We are designed to eat foods in their complete package. With their fiber, roughage, and everything else. Foods are not the sum of their calories and vitamins, even the things you can't digest are very important. The fiber you can't digest regulates the speed at which food digests, modulates metabolism, slows down release of sugar. It also feeds your good bacteria along with other functions. Low fiber foods are linked to bad bacteria in your body. 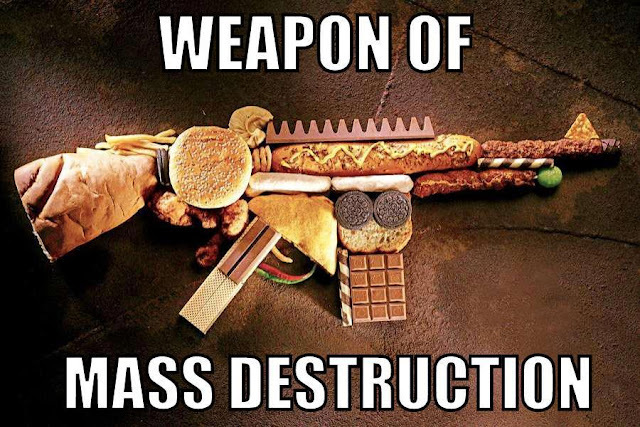 We now eat processed concentrated foods, without the roughage, fiber, or nutrients but concentrated in the sugars. So much more food in a smaller package which short circuits our ability to tell when we are full. Outside of soups, our ability to drink our food and calories (or allow it to melt in your mouth) is fairly new and has wreaked havoc to our bodies. Now foods come in pills, powders, meal replacements, and bars. This is the opposite of food. A 34oz soda has the equivalent sugar to 8.5 feet of sugar cane. There is no way we would be able to eat that much sugar naturally, and if we tried it would take a very long time, maybe days. Now you can consume it in 20 minutes or less. We can over-ride fullness. These things we know for certain. So with that information, look at your own diets and things you try and different health fads and trends and see how what ideas that they are based on. They may be based on a health concept, but is it based on a natural diet? Eat more raw vegetables, eat fruits sometimes (vegetables and fruit not fruit and vegetables), avoid processed foods and beverages and sugary foods, avoid too much exposure to wheat, corn, soy, potatoes, sugar, and eat a variety of foods. Get a good amount of natural protein. And slow down and eat less. No natural diet is based off of pigging out every meal of the day.